Nothing much to say here, looked a good deal, shared the fun. I'd say tilda was india's finest, although I can't decide if the fields are in the Pakistani or Indian part of the Himalayas. BUT, of course you can't buy 10kg of tilda basmati at anywhere near £8 - so voted extremely hot. Very good rice - Tesco often have the Gold and Platinum Kohinoor on offer. Have not noticed a great deal of difference between Silver and Gold rice but the Platinum is really very nice. Tilda is a marketing agency/brand their rice can come from various sources within the region. sounds like these are the cheapest in the range? i use Gold rice and they are very nice indeed. It is nation wide, I sent out 32 packs to one house the 24 packs the next day to another house! Not sure if this has come back on offer or has been on a few weeks as my other half picked a bag up a couple of weeks back for this price. I forgot all about putting it on here though. Great price. Eating the gold now... So there's not much difference between gold and silver? Eating the gold now... So there's not much difference between gold and … Eating the gold now... So there's not much difference between gold and silver? only one way to find out !! None in my local. Quite a big ASDA as well. Tasted some of the Silver grade rice today, i will be buying again. I'd say tilda was india's finest, although I can't decide if the fields … I'd say tilda was india's finest, although I can't decide if the fields are in the Pakistani or Indian part of the Himalayas.BUT, of course you can't buy 10kg of tilda basmati at anywhere near £8 - so voted extremely hot. Tilda is Indian but rice isn't really grown anywhere near Himalayas. It is grown in the plains of India and Pakistan. Needs too much standing water to grow basmati, which unfortunately isn't possible on the mountains. 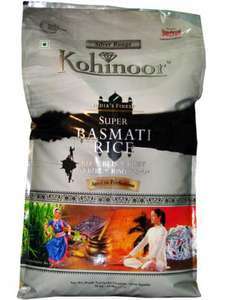 Oh and Kohinoor is way off from being India's finest basmati rice....but for this price, it is pretty good. This has been posted before about a month or so back...it has been this price for time. I bought it back in November at this price...good rice though. I use Basmati rice a lot and I can tell you silver is crap. I was not aware Kohinoor has all these bands of silver / gold and platinum so bought the one from local shop as Silver was cheapest. But I can tell you from my dinner last night this is really crap. However Platinum is very good. Never going to buy Silver again. Dont know how i will finish 5 KG pack!!! I use Basmati rice a lot and I can tell you silver is crap. I was not … I use Basmati rice a lot and I can tell you silver is crap. I was not aware Kohinoor has all these bands of silver / gold and platinum so bought the one from local shop as Silver was cheapest. But I can tell you from my dinner last night this is really crap. However Platinum is very good.Never going to buy Silver again. Dont know how i will finish 5 KG pack!!! send it to a food bank. OUT OF STOCK Grrrrrrrrrrrrrrrrrrrr ! Tesco have gold ones for £6 / 5 kg. or Akash £5 / 5kg. little more expensive but worth extra in my opinion. often they do promotions 2 for £10.